We may use them so often we forget – brakes are essential to your safety every time you get in your car. Brakes wear down and need to be replaced every few years, but in the meantime, maintaining your brake system can keep you and your passengers safe. Brakes are a sealed fluid system, based on some pretty sophisticated math and physics. When you step on your brake pedal, this system is able to apply pressure to all four brakes, according to SmartMotorist.com. Check Brake Fluid – Typically, there is a brake fluid reservoir in your engine. Make sure it’s filled to the proper level, and get your brake fluid flushed and changed regularly (about every two years). Check Brake Lights – If your brake lights aren’t coming on, it usually means the little bulb needs to be replaced. However, if you replace the bulb and the brake lights still don’t come on, you may need to get your brakes checked by a professional. Avoid “Hard Braking” – Keep your eyes on the road and do your best to not have to slam on the brakes. 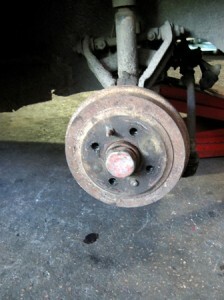 This will avoid locking your wheels and undue wear on your brakes. Remember that brakes do need to be replaced, so if you notice squeaking or slipping when you brake, you may need to visit your mechanic.